this male figure drawing template designed for drawing male body in front view in static position. 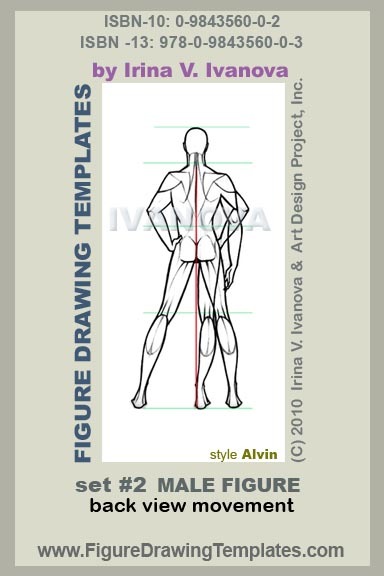 Buy Figure Drawing Templates this male figure drawing template designed for drawing male body in back view in static position. 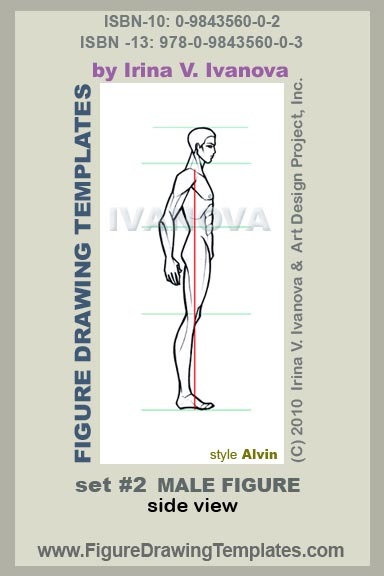 this male figure drawing template designed for drawing male body in side view in static position. Buy Figure Drawing Templates this male figure drawing template designed for drawing male body in 3/4 ( three quarters) view in static position. this male figure drawing template designed for drawing male body in front view with mild movement. Buy Figure Drawing Templates this male figure drawing template designed for drawing male body in back view with mild movement. this male figure drawing template designed for drawing male body in side view with mild movement. Buy Figure Drawing Templates this male figure drawing template designed for drawing male body in 3/4 ( three quarters) view with mild movement. 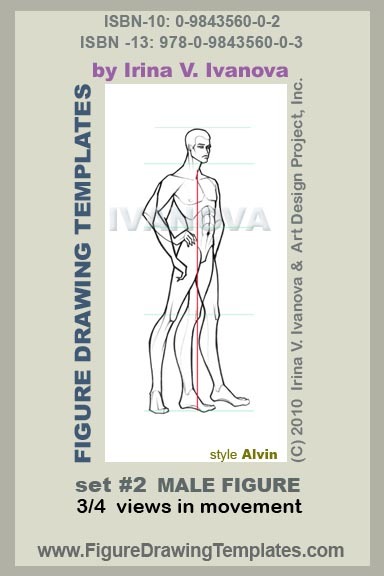 Advance your figure drawing skills by using templates by Irina V. Ivanova . The current edition of Figure Drawing Templates is a book of templates designed for drawing men's body. Templates are eleven inches high and are printed on the twelve inch sheets. Templates are spirally bound and are translucent; making both sides of the templates useable, thus effectively doubling the available figures from the same template. Out of total of eight templates in the book, four templates demonstrate a figure in a static (no motion) pose (front view and the side view) while each of the four other templates present multiple overlapping poses in movement for drawing a figure in movement. The figures in the templates include all necessary visual guidelines, such as balance line and anatomical level lines, making the templates an excellent and easy to use tool for visual reference and for understanding the fundamental concepts of figure drawing. Anatomical level lines include the head line, chin line, shoulder line, waist line, knee line, ankle line and floor level line, all of which are depicted in color on each template. This book of templates could be an excellent educational resource for figure drawing, fashion drawing and fashion illustration. Figure Drawing Templates Set #2 Standard man's figure by Irina V. Ivanova ISBN ISBN 978-0-9843560-0-3 is published and distributed by Art Design Project Inc., Hallandale Beach, Florida, USA. $44.99 USD. Printed in the USA.